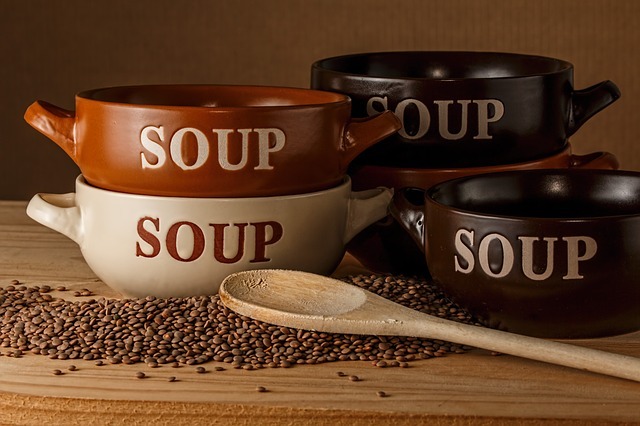 Become the Super-shero or hero of your kitchen with this soup that is guaranteed to bowl your family and friends over. Heat oil in a large pot, add onion and garlic, and cook on medium heat, stirring continuously until soft and onion is transparent. Add celery and potato, slices of the broccoli stalk, stir, then cover pot with a lid, and lower temperature to simmer and cook for five minutes. Pour in the stock and turn up heat to medium, and cook for 10 – 15 minutes, stirring, until all the vegetables are soft. Add the rest of the broccoli, and cook for five minutes (until broccoli is al dente). Taste to adjust the salt and pepper. Transfer soup to a blender (or food processor), blend until smooth, but you can also choose to blend half the soup and leave the other half allowing for a few lumps. Transfer soup back to the pot, cover and lower heat to simmer (just to keep it warm). At this point, make the baguette crouton by heating oil in a pan over medium-high heat, then add the baguette slices, ensuring that the slice is evenly coated with oil. Fry for 4 minutes, turning them over to brown on both sides. Remove from heat, place on paper towel and return to the soup. Turn the heat off, and slowly add the grated cheese a handful at a time, stirring to avoid clumpy cheese. Once all the cheese has been added is melted, remove from heat, and ladle into soup bowls immediately, and top with a toasted baguette crouton. In a large pot, add all the roasted vegetables, then add your stock (or water). Add enough just to cover all the vegetables. Stir in the orange juice, and taste. This is where you would add salt and pepper to your taste. Stir and simmer for 30 minutes. 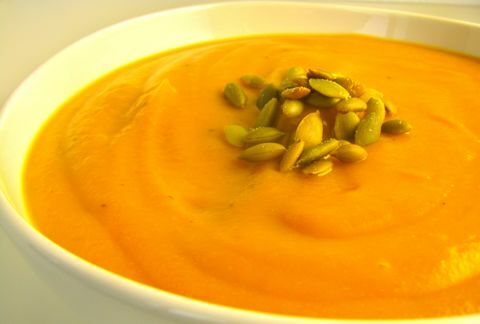 Using a Vita-Mix, or Blender, or hand blender, blend the soup to a creamy consistency. Top with your favorite toppings, and serve with crusty bread. As you can see, it’s a very flexible and forgiving recipe. If you have any questions about this recipe, please comment here. Social media has been all a twitter and buzz about the cold temperatures we’ve all been experiencing this winter. Besides a good comedy movie, book, dancing music, and interaction with family and friends, hot soup on a cold day brings a ton of happiness and gets your glow on. One of my favorite vegetables is Swiss chard. It’s not only healthy, but has a mild, unique taste that adds a lot of flavor to any soup. 2 bunches Swiss chard, washed, chopped into bite size pieces, and also the stalks can also be used. Cut the stalks crosswise. Cook diced potatoes in a separate pot in boiling salted water for 6 – 8 minutes. Drain and set aside. In a big soup pot, heat oil and add bacon, cook until bacon is still soft, then turn heat down to medium and add: onion, garlic and parsley, and continue cooking, stirring constantly, to loosen any bits at the bottom of the pot. Cook until onion is soft. Add can of tomatoes and stir, breaking up the tomatoes, and cook for 2 – 3 minutes, constantly stirring. Add the broth and turn up heat to high and let cook for 10 minutes. Then add the Swiss chard, potatoes and beans, stir well, and let the soup come to a boil. Then turn heat down to simmer for 15 minutes. For more recipes PLUS a children’s novel and a comedy short story all bundled up in one book, please check out: Wishes, Stitches & Dishes: Bundle of Family Fun. Welcome to another Tasty Tuesday. Be sure to stop by my fellow author friends’ blogs (links listed below) and check out what they have cooking. The crisp, colorful autumn days ahead always turn my thoughts to making soup-a-licious dishes. I love soup because it’s easy to make, you don’t have to be exact in the measurements, (for the purpose of this blog, I have included exact measurements…somewhat) uses up a lot of leftovers and you can fuel your body with all the anti-oxidant goodness from vegetables and fruits in one bowl. On a baking sheet lined with parchment paper (or you can spray your sheet a non-stick spray) arrange the carrots, butternut squash and sweet potato in a single layer and lightly coat vegetables with olive oil and sprinkle some Sea Salt. Turning once, bake until the vegetables are tender. In a large pot saute the onion and garlic in a bit of olive oil. Add all the baked vegetables plus pureed pumpkin and the pears into the pot. Add enough broth (or water) to cover all the contents. ****Optional: You can also sprinkle in curry powder, if you like curry. Simmer on stove for about 40 – 50 minutes. Return the soup to the pot and re-heat on low, stirring. If you have leftover soup, here’s a quick and easy way to use it. Simply use the leftover soup and coat chicken breasts, crush some almonds on top of the chicken breasts and bake. Be sure to stop by these other blogs and pick up more recipes.